This creamy spinach dip is easy to make. In fact, there’s no cooking required. A few simple ingredients come together to make a creamy dip that’s ready in just a few minutes. If you’re old enough, you’ll remember that old school onion dip that was real popular in the 70’s. This is a delicious update with chopped spinach and cream cheese. It’s really simple, but pretty great. 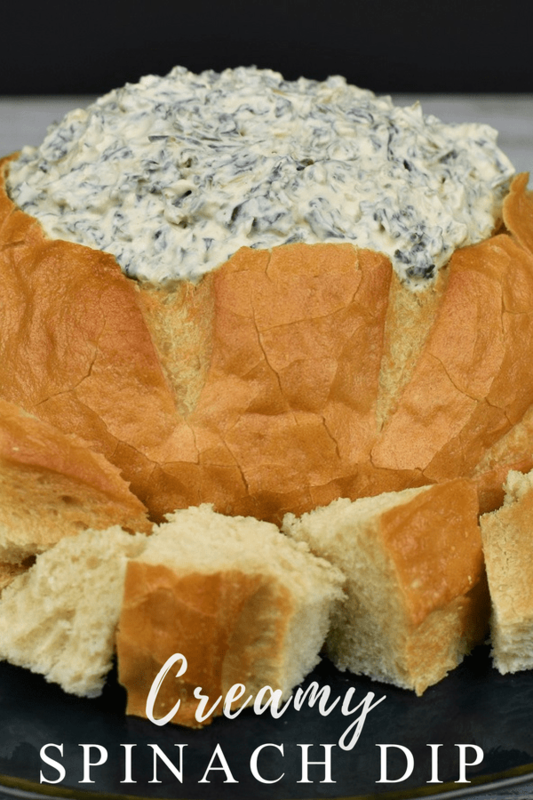 Serve it in a bread bowl for a lovely presentation; it will be a hit at your next party! Need more great appetizers, try these andouille sausage puffs or this cold Buffalo chicken dip. Enjoy! Dry the spinach; use a piece of cheese cloth, kitchen towel or sturdy paper towels to squeeze as much liquid as you can from the spinach. In a large bowl mix together the spinach, sour cream, cream cheese, onion soup mix and black pepper. Mix until all of the ingredients are well combined. Use a bowl that’s bigger than you need so you can really get in there and stir. Use a rubber spatula to get under the ingredients and fold them up. Then keep stirring until the spinach is distributed throughout, and the dip is super creamy. Taste the dip and add salt, if needed. Cover the bowl with plastic wrap and refrigerate until ready to serve. Stir well before serving. You can make this dip a day ahead; it keeps just fine in the refrigerator. 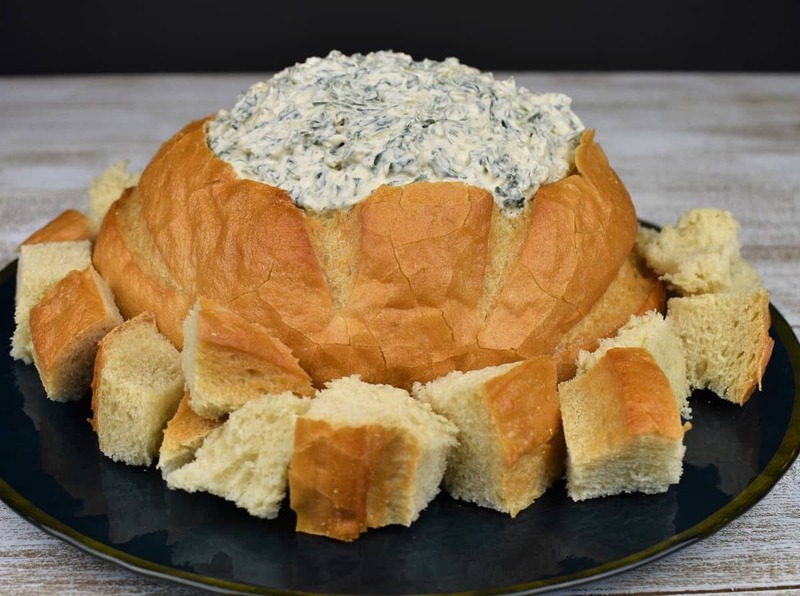 I like to use a glass bowl or clear plastic container in the bread bowl to prevent it from getting soggy. This way, I can keep refilling the bowl and the bread holds its shape until it’s time to eat the bread bowl. Use a bowl that’s smaller than the bread. Place it on top, rim side down, and trace around it with a knife tip. Use a serrated knife, and work your way around the outline until you can remove the top. Then remove pieces from inside the bread until it’s hollowed out enough to hold the dip (or fit the bowl if using). You don’t need to add all the dip at once, you can refill as the party goes on. Cut the top and the inside pieces of bread into cubes and reserve to serve with the dip. 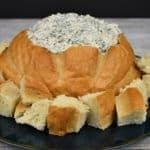 Just before serving, add the spinach dip to the bread bowl and serve with the reserved bread pieces, raw vegetables, crackers, chips or your favorite dippers. In a large bowl mix together the spinach, sour cream, cream cheese, onion soup mix and black pepper. Mix until all of the ingredients are well combined. 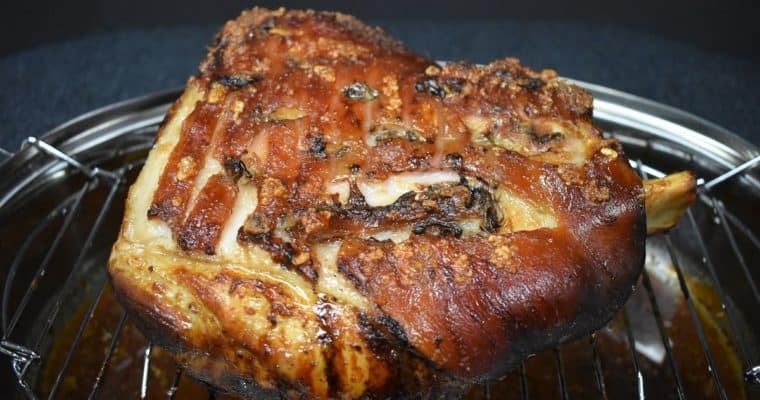 Taste and add salt, if needed. Cover with plastic wrap and refrigerate until ready to serve. Stir well before serving. 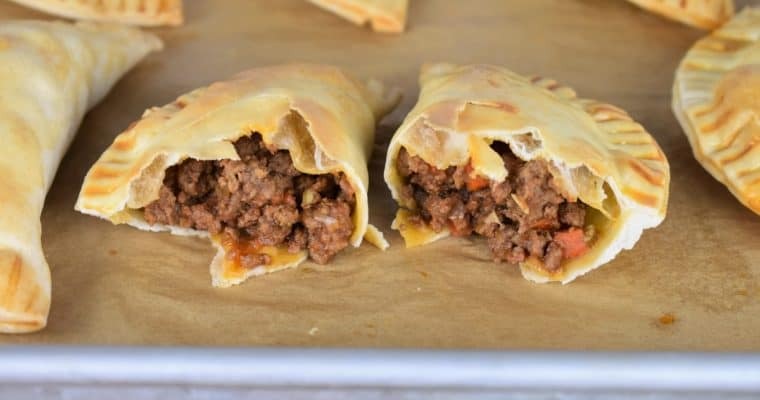 These beef empanadas are baked not fried and feature an easy-to-make ground beef filing. In this recipe we use premade empanada disks so they come together really quick. And with step by step instructions, you’ll be an expert in no-time. Empanadas make great appetizers, and they’re perfect for breakfast, brunch or as a mid-day snack.